Now, as she sneaks around the dirigible school, eavesdropping on the teachers' quarters and making clandestine climbs to the ship's boiler room, she learns that there may be more to a school trip to London than is apparent at first. A conspiracy is afoot--one with dire implications for both supernaturals and humans. Sophronia must rely on her training to discover who is behind the dangerous plot-and survive the London Season with a full dance card. In this sequel to bestselling author Gail Carriger's YA debut Etiquette & Espionage, class is back in session with more petticoats and poison, tea trays and treason. Gail's distinctive voice, signature humor, and lush steampunk setting are sure to be the height of fashion this season. With each release, Gail Carriger more firmly cements herself onto the list of authors who I will just automatically read everything that they publish. 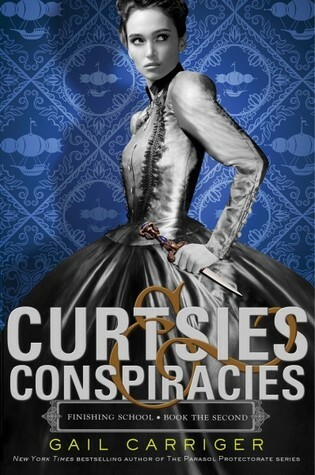 Curtsies & Conspiracies, the latest installment in Carriger's steampunk universe, is no exception. We pick up not long after where Etiquette & Espionage left off, and if you haven't read that one, you should back up and read it first, to get a full appreciation of the characters and story universe. The plot builds largely on the outcome of the plot of the first book, so you should definitely check that out. This book continues the trend of delightful whimsy and espionage from the first. And this time around, Sophronia and company don't just have to deal with your typical school-of-espionage problems; this time around, there are boys! And while Sophronia is a pro at clandestinely navigating through her floating dirigible school after hours, she isn't so hot at dealing with boys flirting with her. It's pretty hilarious watching her be out of her element at something. There are just a few hints of romance, but Sophronia is still young and it's more about her trying to understand some of the strange new feelings she has. She's just as sassy and independent-minded as ever, and I don't think that will ever change, which is excellent. The plot in this one alternates between fast-paced hijinx and more slowly-paced day-to-day life of the girls in school, petty drama/infighting, etc. Sometimes when things happen, they happen all at once and the action can be a little difficult to follow, but that is kind of par for the course for these books and really for this genre in general. This book ties the plot more into the larger universe of Carriger's other series, the Parasol Protectorate books, and there are a few more guest appearances from characters well known to people who have read the other series. As the ties get tighter, I am more excited to see how Sophronia and others fit into the universe we already know and love. This is another solid entry into Carriger's catalogue and I can't wait to see how the series continues. Thanks to the publisher, we have a finished copy of the book to offer for a giveaway. If you've got an address in the US (no PO Boxes), enter our giveaway below! sounds fun! Thanks for sharing! I loved E&E and I can't wait to read C&C!